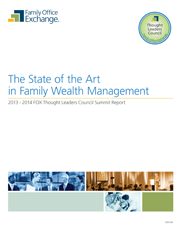 The State of the Art in Family Wealth Management is a great resource for those who need to better understand what it means to be an “enterprise family” and understand how to work within a Family Enterprise Framework. Inside you’ll find the big picture view of the work that families need to be prepared to do, where families need to focus their efforts, and how families and advisors must work together. In addition to being a great resource for families, it’s also valuable for advisors who want to better understand the needs of their family enterprise clients’ and find out how their own practices compare to State of the Art. Section One: Understanding the Family Office Framework explains what it means for families and advisors to work together within a Family Enterprise Framework. Section Two: The Hallmarks of State of the Art Advice outlines the common practices that help to define State of the Art Advice, regardless of discipline. Section Three: State of the Art in Practice defines the gaps between State of the Industry and State of the Art in key family wealth management disciplines. Understand how an enterprise family is defined and learn what it means to work within a Family Enterprise Framework. Understand where families should be focusing their efforts. Be able to recognize State of the Art advice and understand its value. Understand how families and their advisors from different disciplines within the family enterprise framework must work together.